Small timbers are loaded onto the conveyor belt at Victory’s chip and lumber mill in Camden, AR. In 2009, the principals of Victory Lumber purchased a shuttered lumber/chip mill facility from Arkansas Economic Development Commission. Over the past 5 years, Victory has operated the chip mill, while developing a strategy to rebuild and restart the larger lumber mill. 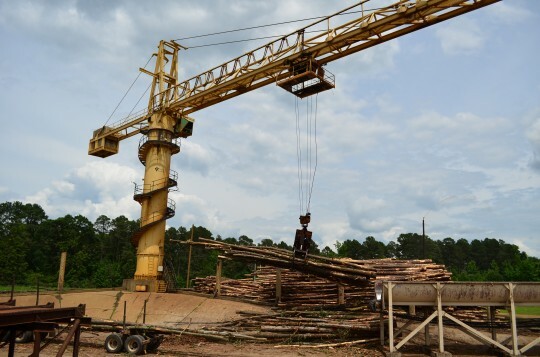 On December 29, 2014, Victory Lumber and Crescent Growth Capital closed on a $12.06MM Arkansas State NMTC allocation and a $9MM Federal NMTC allocation to finance the $10MM renovation budget. NMTC allocations were provided by Enhanced Capital and Stonehenge Capital who provided $7.3MM and $4.8MM of State NMTC’s, and $5MM and $4MM of Federal NMTC allocation, respectively. First NBC Bank provided term and bridge construction debt. The fully-renovated lumber mill will add 54 full-time jobs to Victory’s 11 existing positions at the chip mill, in a census tract with more than 15% unemployment. The project will also bring back to commerce one of Camden’s largest manufacturing facilities.